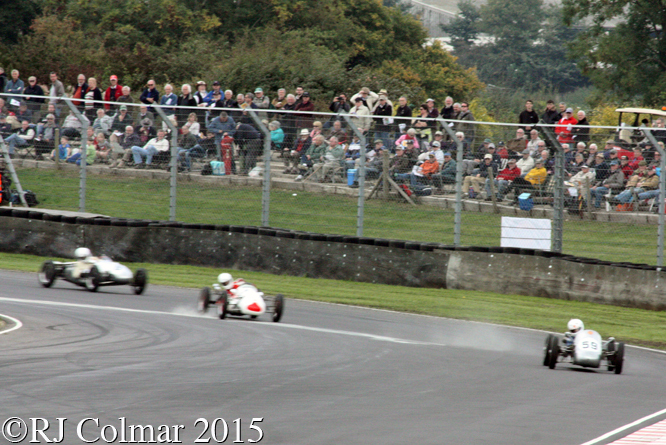 Last Saturday saw the 4th action packed Autumn Classic at Castle Combe which saw large numbers of fans entertained with nine races and several demonstrations most notable for this observer of which were a pair of BRM P160’s from 1972 and a 1973 which regaled the Wiltshire countryside with the awesome sound of a couple of unsilenced V12’s. 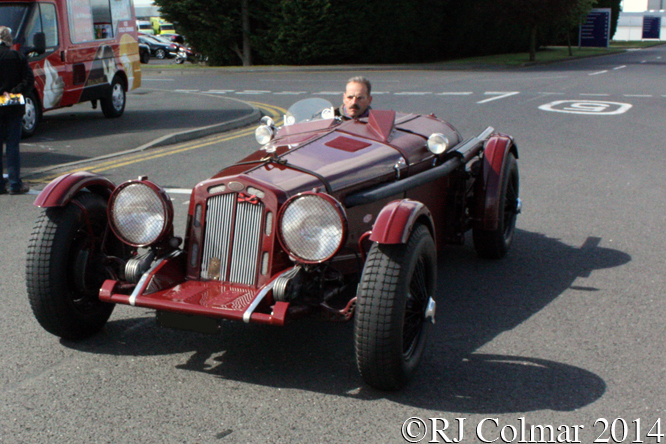 Patrick Blakeney-Edwards had a moderately successful day as a driver, above he is seen scampering away from a delightfully varied field to win the VSCC Sports Car Race aboard his Frazer Nash Super Sports. 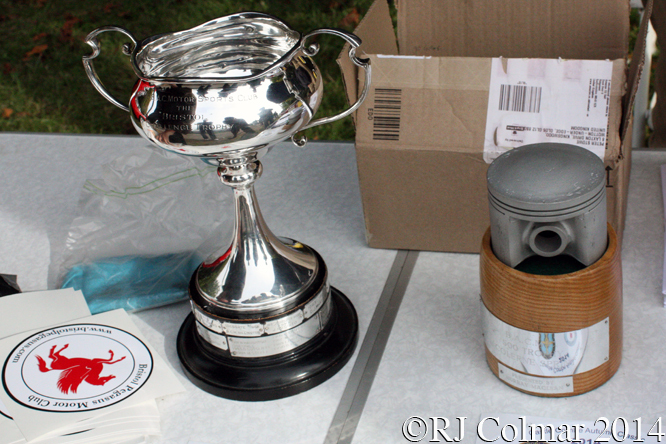 The JEC Norman Dewis Trophy for Pre 66 Jaguars was won by Martin Hunt driving a Blakeney Motorsports prepared E-type Jaguar while one of the most entertaining battles of the day was fought by Grant Williams and Richard Butterfield both in Mk 1 Jaguars and Peter Dorlin in his Mk2 after Andy Wallace also in a Mk2 retired from third at the half way stage, Grant hung on to finish first saloon home in the #12 seen above. 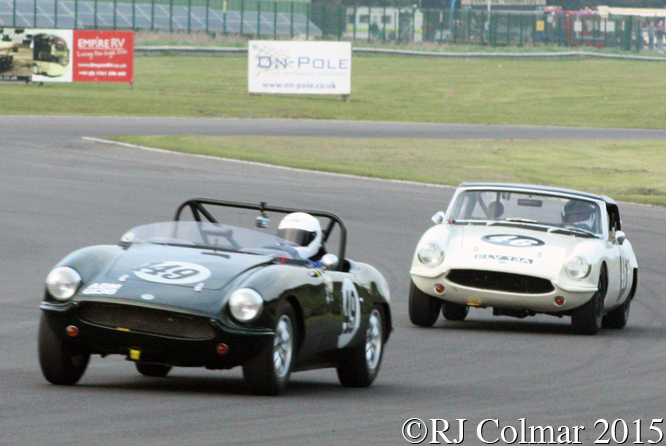 David Grace driving the #17 Austin Healey 3000 Mk1 won the first of the two Healey Driver International Challenge 25th Anniversary races from second on the grid beating pole sitting white and blue #46 driven by Healey Specialists Bill and Jack Rawles by just under 4 seconds. Steve Brooks starting from third on the grid in the #34 Aston Martin DB3S is seen above about to go into the lead on the opening lap of the Fiscar Historic Intermarque race, he looked set for a win until the race had to be called on lap 12, before the compulsory pit stops had cycled through, which meant Stephen Bond in the #95 Lister Bristol starting from 8th on the grid was declared the winner after an accident involving three cars without injury to the drivers blocked the track at Quarry. Andrew Turner in the white and red #2 Cooper Mk VI led the opening 8 laps of the BAC Motor Sports Club Challenge for F3 500’s race from 3rd on the grid until he was caught and passed by Xavier Kingsland in the silver Staride Mk 3 two laps from home, pole sitter Darryl Woods in the Cooper Mk XII kept the two race leaders honest and finished 3rd just less than 1 second behind the winner ! 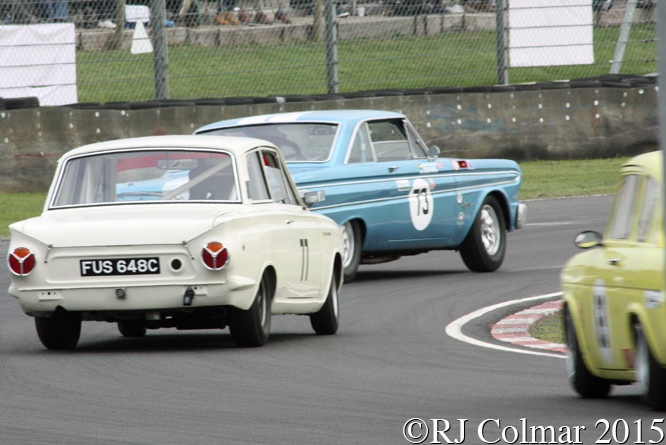 Michael Squire easily won the HSCC/HRSR Historic Touring Cars race from pole driving a flame spitting Ford Mustang, but second place finisher Chris Clarkson had a very busy time keeping eventual third place finisher Chris Saunders in the white #77 Ford Cortina and Bob Bullen in the yellow #69 Ford Anglia behind. 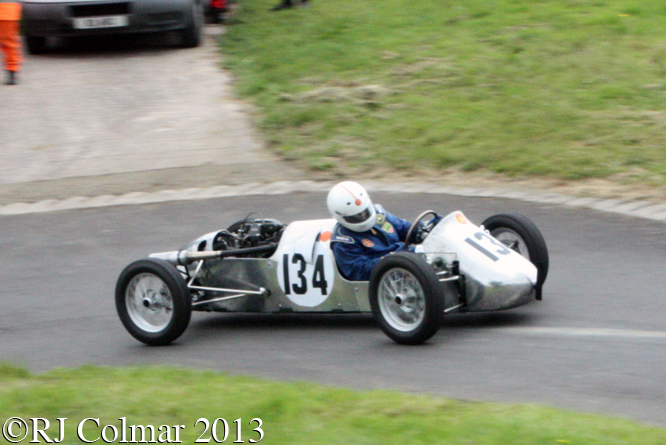 Jack Woodhouse made a great start from 2nd to lead the opening 9 laps of the FJHRA/HSCC Millers Oils Formula Junior race in the white #84 Lotus 20/22 before yielding to the faster #53 Lotus 20/22 driven by 3rd place starter Sam Wilson seen in third place at Quarry above. Sam however tripped up behind a back marker on the final lap to let Jack back into the lead which was just .2 of a second over Sam at the finish line. Having been unlucky in the Fiscar Historic Intermarque race Stephen Brooks easily won the Jon Gross Memorial race in his DB3S leaving Sean Kukula and Jonathon Loader to squable over second place in their #149 and #46 Elva Courier Mk4T’s respectively, Sean won the Elva battle which was fittingly once raced by American Jon Goss. 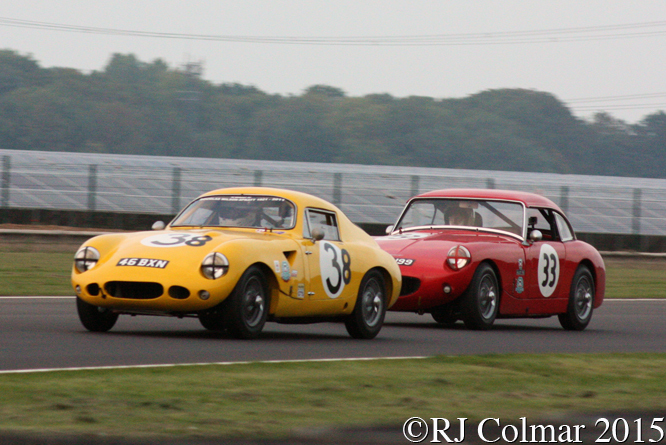 Finally the Healey’s came out for a second race which again provided plenty of thrills with third place starter Marc Campfield making the running for the opening 8 laps until his car ground to a halt which left pole man David Grace to claim a 4.5 second victory over the Healey 3000 shared by 5th place starters Jack and Oliver Chatham, above as in the first race the Healey Sebring of Sprites of Richard Woolmer #38 and Gordon Elwell #33 kept spectators entertained further down the field on their way to 9th and 10th place finishes less than 2 seconds apart. Thanks for joining me on this “4th Autumn Classic” edition of “Gettin’ a li’l psycho on tyres” I hope you will join me again tomorrow when I’ll be looking at a six cylinder Plymouth. Don’t forget to come back now ! 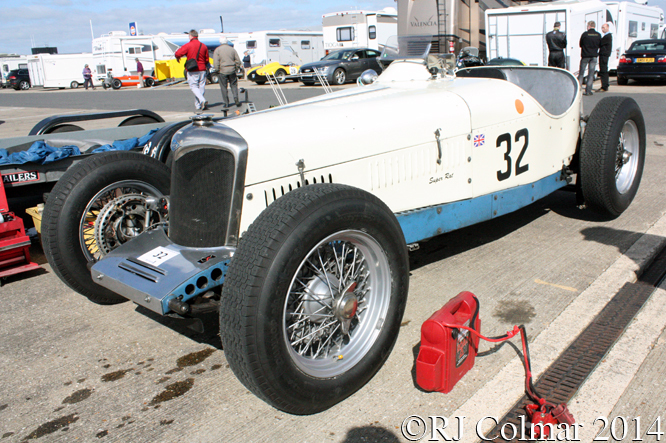 This entry was posted in Uncategorized and tagged 20/22, 3000, Anglia, Aston, Austin, Autumn, Blakeney, Brooks, Bullen, Butterfield, Castle Combe, Clarkson, Classic, Colmar, Cortina, Courrier, DB3S, Dorlin, Edwards, Elva, Elwell, Falcon, Ford, Frazer, Grace, Healey, Jaguar, Kingsland, Kukual, Loader, Lotus, Martin, Mk3, Mk4T, Nash, Psychoontyres, Ralph, Rawles, Saunders, Sebring, Staride, Williams, Wilson, Woodhouse, Woolmer on October 7, 2015 by Ralph. Mike Erskine Speedway rider who owned a factory that manufactured motor vehicle radiators who also built Staride frames for Speedway motorcycle racing in Southampton. 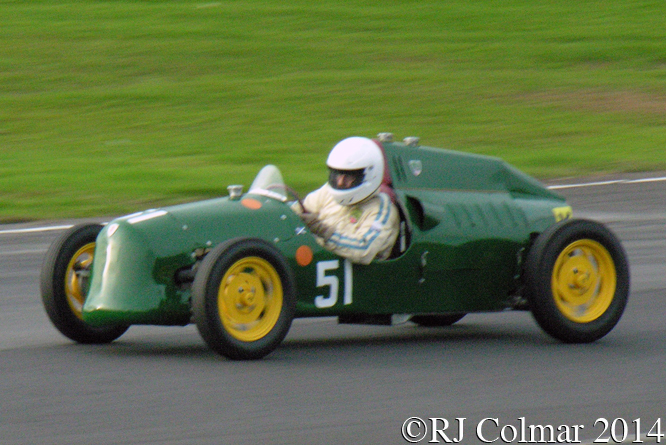 At the end of 1951 he quit Speedway and started building a prototype 500cc Formula 3 car to a design, an evolution of a Kieft design, by former Kieft designer Dean Delamont and Cecil Mitchell for John Hambin. 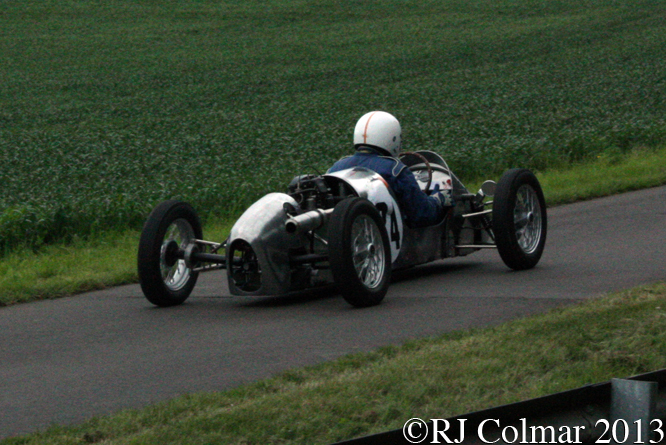 On it’s debut at Goodwood in April 1952 John finished 4th. A production protoype Staride also appeared in 1952. 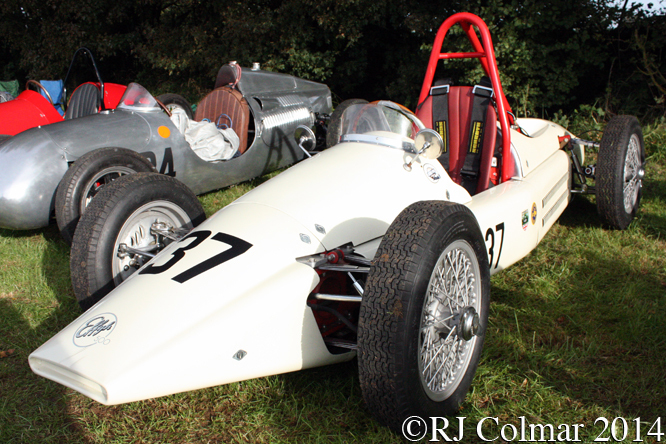 For 1953 a production run was started and Reg Bicknell who had successfully built and raced the Revis was one of the works supported drivers. 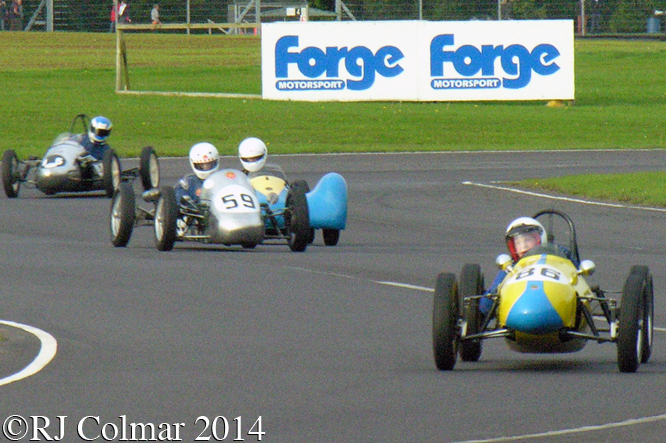 Reg was a regular top three finisher in International Formula 3 events through 1953 as was Dennis Taylor in 1954. 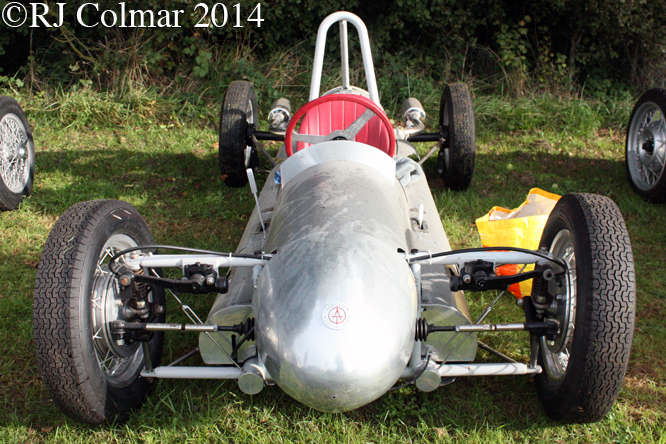 It is believed 10 Starides, weighing 500lbs, were built and they were offered for sale at £550 less engine and gearbox. 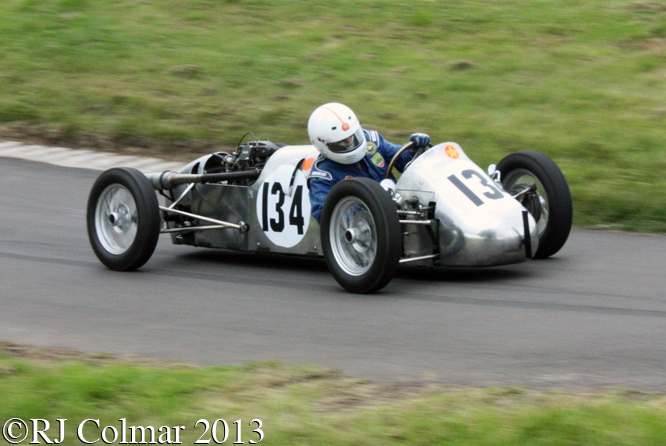 Today’s featured 1953 Staride Mk3 is seen at Gurston Down and Oulton Park last year with Xavier Kingland at the wheel. 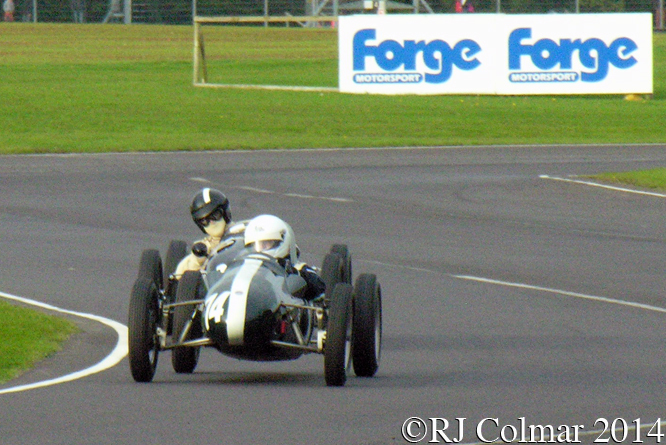 Anyone within traveling distance of Castle Combe will have the opportunity to see 500cc Formula 3 cars, like the Staride and Revis I looked at last week, tomorrow where they will be racing for the Bristol Aeroplane Company Motor Sports Club Challenge Trophy along with seven more races and a plethora of classic car demonstrations and static displays. 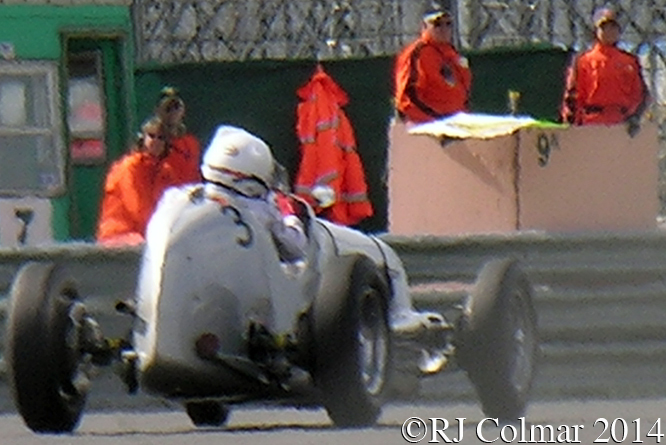 Thanks for joining me on this “Pinacle Of 500cc F3 Design” edition of “Gettin’ a li’l psycho on tyres”, I hope you will join me again tomorrow when I be starting an 80th Anniversary Celebration of English Racing Automobiles (ERA). Don’t forget to come back now. 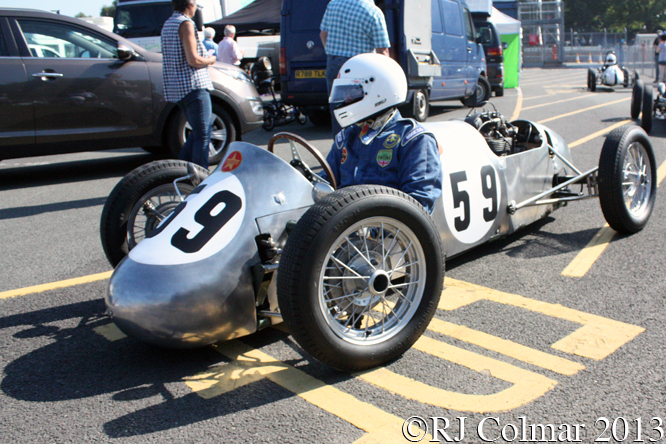 This entry was posted in Uncategorized and tagged Bicknell, Colmar, Delamont, Erskin, Gurston Down, Hambin, Kingsland, Mitchell, Oulton Park, Psychoontyres, Ralph, Staride, Taylor on October 4, 2014 by Ralph. 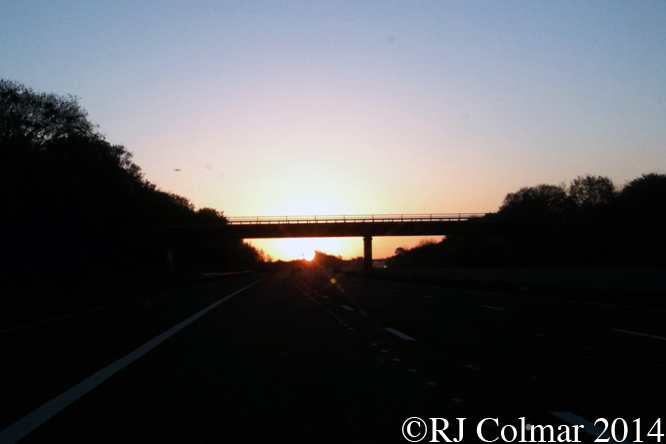 I awoke at 3:40am on Sunday full of anticipation, the weather forecast was good, the dawn chorus was getting underway as I prepared my sandwiches and daylight was lighting up the day as I headed towards Silverstone with my friend and regular GALPOT contributor Tim. We took the fast route in order to get to the circuit early, meeting up with friends for breakfast in the canteen we were saddened to learn of the death of Lotus Elan driver Alan Fleming in Hockenheim the day before and that Garry White had been seriously injured driving a GN Gnome the same day at Silverstone. 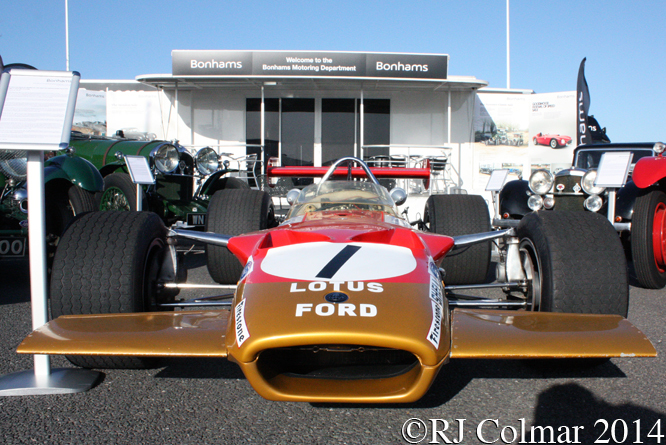 Tim and I took a wonder round the paddock in the morning where we were astonished to find the late 1968 Lotus 49 R8 as raced by Graham Hill, Richard Atwood, Jo Bonnier and most successfully by Dave Carlton in South Africa to two local F1 championships, form the center of a Bonhams display. The car is expected to fetch between £700,000 and a million at Goodwood in June. 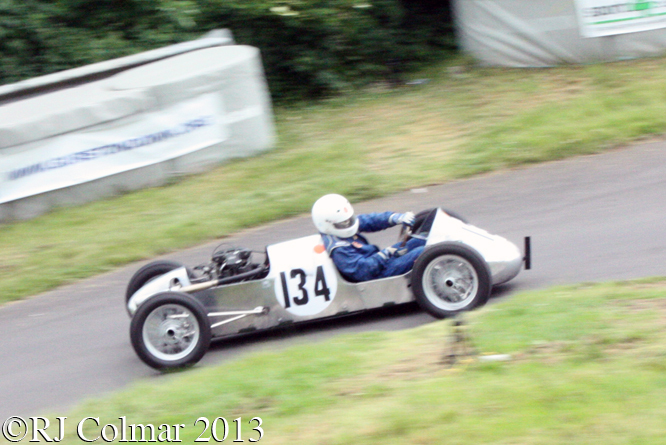 While we were working our way through the paddock the vehicle above wafted through the crowd, I was surprised to learn it appears to be powered by a Standard Vanguard motor, if you know anything else about the car please chime in below. 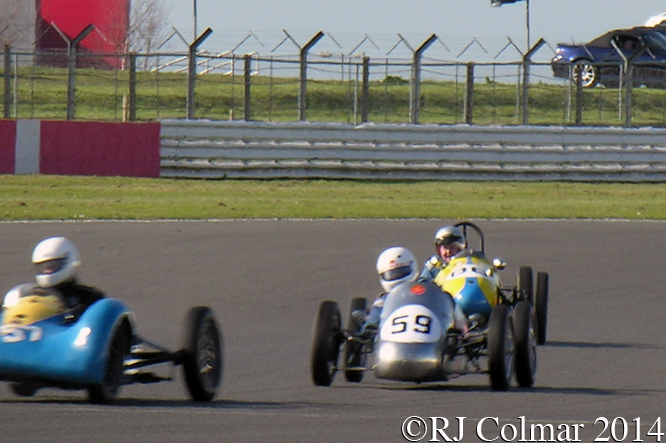 The racing got underway with the ERA 80th Anniversary Trophy which was one by Mark Gilles aboard the green wheel lifting 1934 ERA seen leading the ERA 11B of David Morris which retired leaving Nicholas Topliss in the #5 blue ERA R4A to finish second. 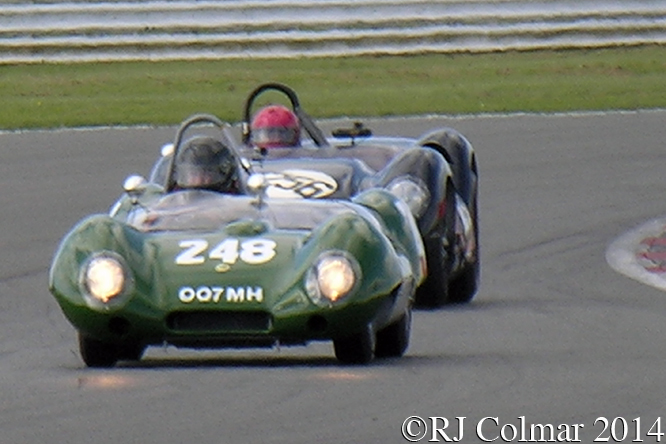 The battle for honours in the front engined Formula Junior race lasted the whole race with Simon Goodliff in his red 1960 Lola Mk2 managing to hold off the green 1959 Elva 100 driven by Mark Woodhouse. 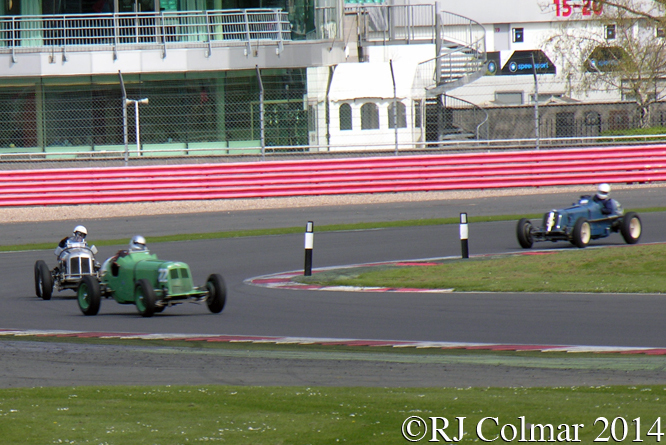 Pete Candy driving the 1936 Riley Super Rat seen in the paddock above won the 8 minute Short Scratch Race for pre war cars. 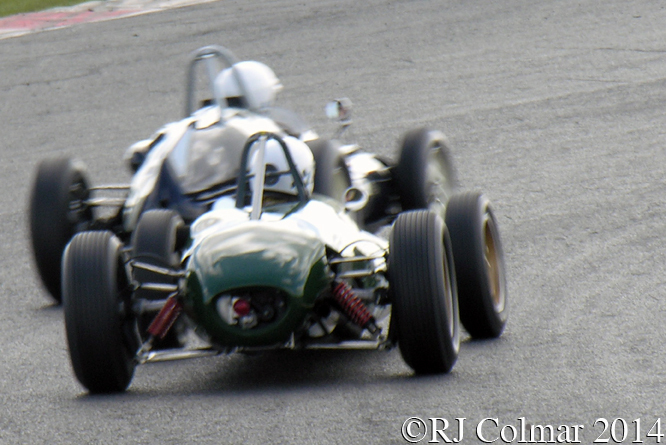 The action continued with the second race for pre ’66 Grand Prix Cars which was won by John Romano who clocked up his second win of the weekend in his 1964 Brabham BT11. 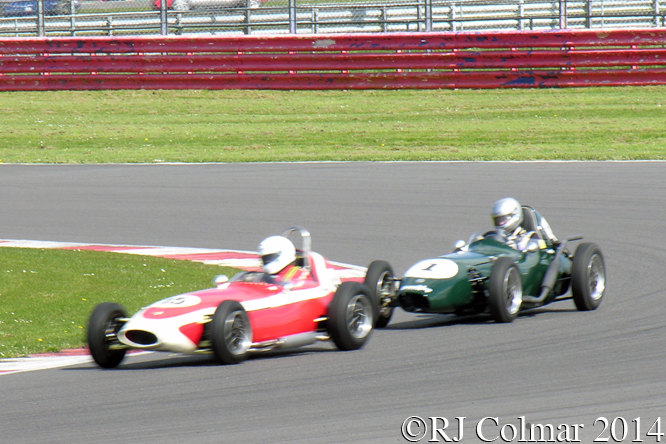 Above Alex Moreton in his 1961 Lotus 21 is about to lap Paul Griffin in his 1959 Cooper T51 on his way to a seventh place finish. 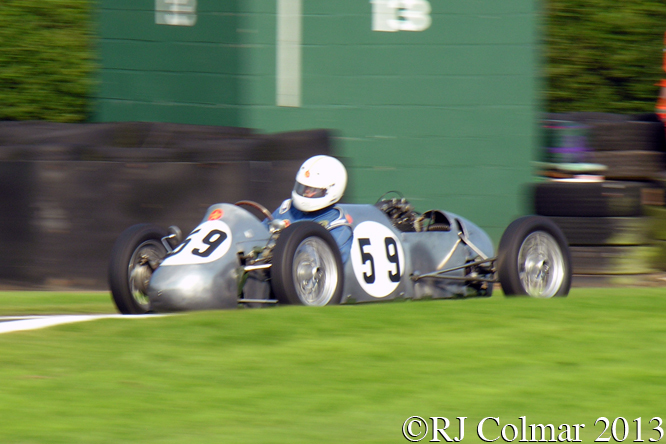 It’s always great to see one of my former race instructors, from 1989/90, take part in an event above one such was Calum Lockie who is seen driving a 1938 Maserati 6CM to victory in the pre 1941 Continental Trophy race. 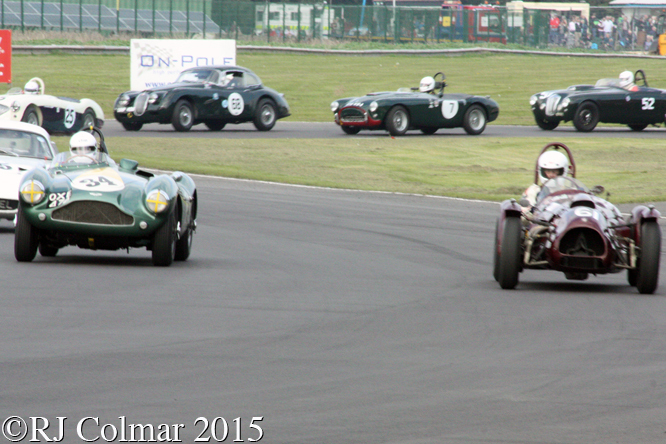 Regular readers will have heard me make many references to The Nostalgia Forum who’s knowledgeable members include Peter Horsman seen above driving the #248 Lotus 15 above to victory over the #256 Lister Jaguar of Dr Barry Wood in the 1950’s sports racing cars event. 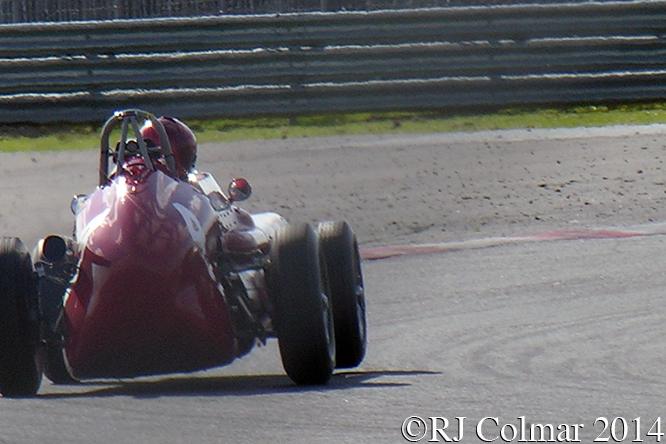 Tony Wood lifts a wheel at Becketts above on his way to his second win of the weekend in the Pre ’61 Racing Car event driving the 1959 Tec Mec F415 which readers may remember I looked at in some detail recently. 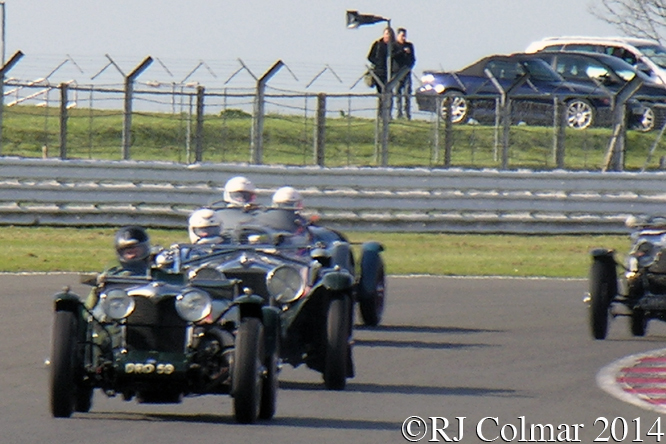 By comparison the 5 lap pre war Handicap race felt like a race in slow motion, above a couple of Rileys lead a gaggle of cars in the event which was won by Richard Hudson driving a Bentley. 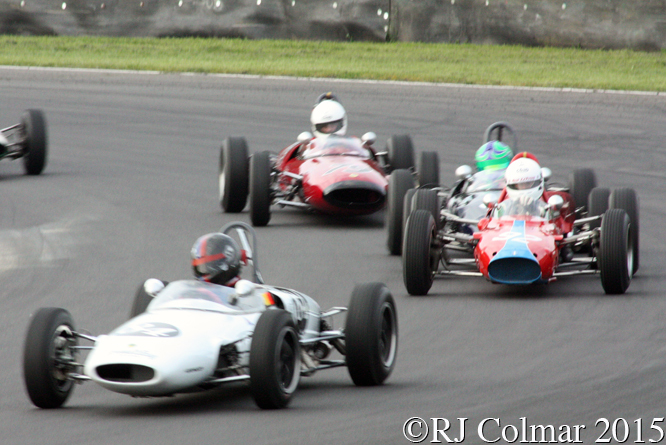 The penultimate event of the day was for the 500 cc / 30.5 cui Formula 3 cars this was declared, with Ian Philips the winner, after the; #57 Revis driven by Richard Bishop Miller, #59 Staride Mk 3 of Xavier Kingsland and #86 Cooper Mk 9 of John Turner came to grief at Becketts one lap after the photo above was taken. 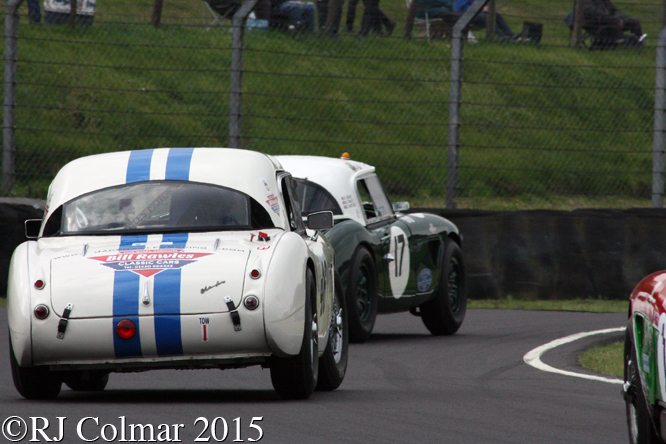 I am not entirely sure what happened but the out come was that John Turner was thrown out of his Cooper and Richard Bishop Miller had to be cut out of the Revis and both were taken to hospital. 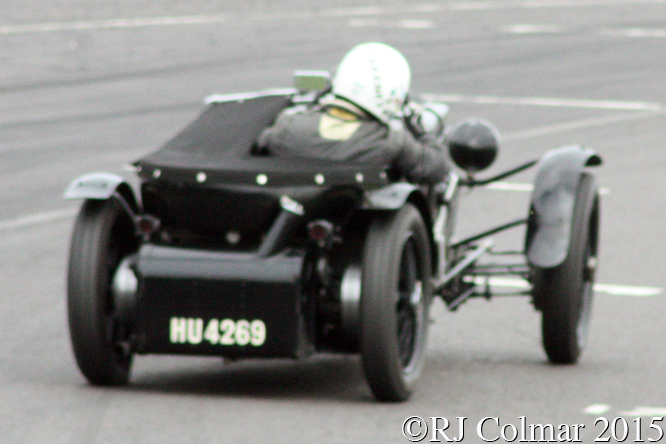 Andrew Mitchel won the final Pre War race of the day driving an HRG but by then Tim and I were negotiating a few diversions on the way home, seeing John Turner falling out of his Cooper having left me feeling considerably the worst for wear. 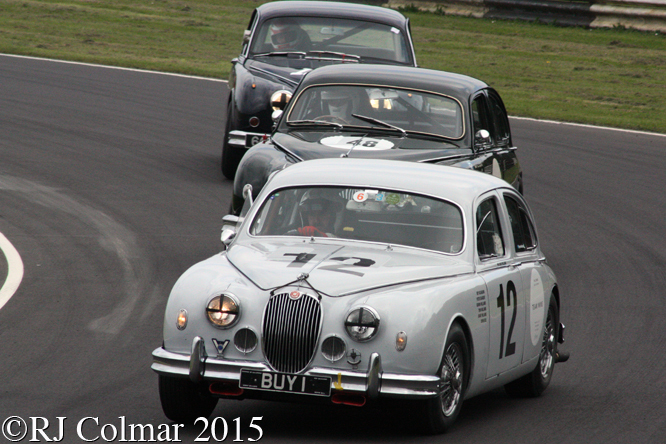 My thanks to Alan Cox at the Nostalgia Forum for pointing me in the direction of the results pdf. 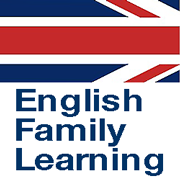 I hope you will join me in offering sincerest condolences to the the family and friends of Alan Fleming and best wishes for speedy recoveries to Garry White, Richard Bishop Miller and John Turner. Thanks for joining me on this”VSCC Spring Start” edition of “Gettin’ a li’l psycho on tyres” and that you will join me again for Americana Thursday tomorrow. Don’t forget to come back now ! 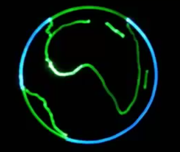 This entry was posted in Uncategorized and tagged Bishop Miller, Bonnier, Candy, Carlton, Colmar, Cooper, Elva, ERA, Fleming, GALPOT, Gillies, Goodliff, Griffin, Hill Atwood, Horsman, HRG, Kingsland, Lister, Lockie, Lola, Lotus, M4, maserati, Mitchel, Moreton, Morris, Ralph, Revis, Riley, Silverstone, Spring Start, Standard, Staride, Tec Mec, Topliss, Turner, VSCC, White, Wood, Woodhouse on April 16, 2014 by Ralph.